What do they filter? Vitasalus PureMaster V-300, V-500 & V-700 Premium Whole House Water Filtration Systems effectively filter chlorine, chloramines, sediment & particulate, cysts, copepods, VOCs, SOCs, THMs, PAHs, atrazine, benzene, xylene, pesticides, insecticides, herbicides, tastes, odors and hundreds of other potential contaminants and harmful chemicals. Sale Price: $845 Best Value! SUMMARY: The PureMaster contains significantly more carbon media and a better pre-filter than most of our competitors which provides cleaner and purer water. The Vitasalus PureMaster V-300, V-500 & V-700 Premium Whole House Water Filtration Systems effectively filter chlorine, chloramines, sediment and particulate, cysts, copepods, VOCs, SOCs, THMs, PAHs, atrazine, benzene, xylene, pesticides, insecticides, herbicides, tastes, odors and hundreds of other potential contaminants and harmful chemicals. Don't settle for less, get a PureMaster today for you and your loved ones! Need help deciding or ordering? Call us anytime Mon-Sun at 1-888-446-8184. The Vitasalus/Equinox Products PureMaster™ V-Series™ (V-300™, V-500™, V-700™) Premium Whole House Water Filtration System utilizes high grade NSF® certified water filtration media and components/parts/materials (per NSF/ANSI Standard 61) and tank (per NSF/ANSI Standard 44). How does the PureMaster™ work? * Lifetime warranty consists of: 1) 10-year defect-free warranty on materials and workmanship involving the NSF® certified tank and tank head components; and 2) Lifetime prorated warranty on the NSF® certified system media based upon the lower value of the advertised media lifespan range as specified in the system's specifications chart. ** The lower end value of the media lifespan range, as specified in the system's specifications chart, is based upon the average annual water usage of a household of 3–4 people. Replace the media or the blue tank with media when the system gallonage capacity is reached or there is a noticeable return of off-tastes and/or odors. Complete System: Includes the Ready-To-Install PureMaster™ V-Series™ System (blue tank unit) plus an installation kit which includes a 0.35-micron prefilter used to filter out potential copepods, cysts, sediment and/or particulate matter down to 0.35 microns in size. Replacement System: Includes only the Ready-To-Install PureMaster™ V-Series™ blue tank unit with filtration media and inlet and outlet head. NOTE: The replacement system option is typically for existing V-300 , V-500 or V-700 owners, or owners of the 3 yr./300,000 gal. or 5 yr./400,000 gal. Equinox Premium whole house water filtration systems that utilize two (2) blue tanks vertically stacked. Replacement Media: Includes only the PureMaster™ V-Series™ filtration media necessary for the different stages within the blue tank unit, and a filter media filling/ refilling funnel. NOTE: This Replacement Media option is for existing V-300, V-500 or V-700 system owners. effectively perform for about 3–5 years/300,000 gallons (V-300), 5–7 years/500,000 gallons (V-500), or 7–10 years/700,000 gallons (V-700) of use for the average household. 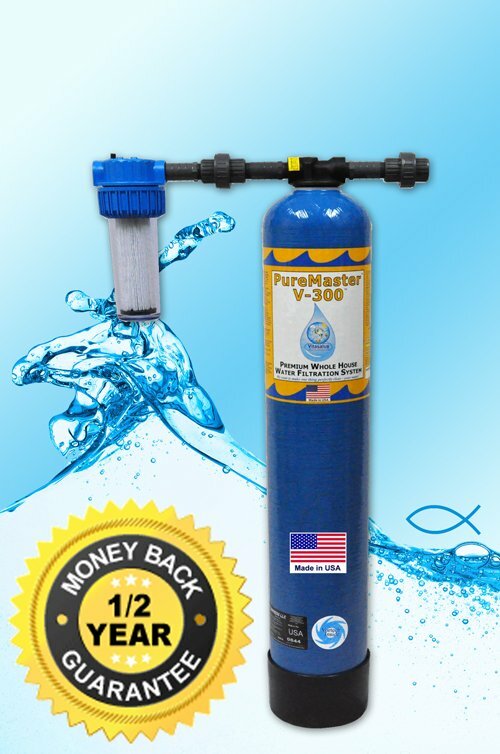 The V-300 is loaded with approximately 30 pounds of NSF® certified high grade water filtration media, the V-500 with approx. 45 pounds of the same media, and the V-700 with 60 pounds of the same high grade water filtration media..
will each provide clear, healthy, drinking-quality water throughout your entire business or home including all showers, sinks, bathtubs, washing machines, dishwashers, and refrigerators. effectively filter chlorine, chloramine/chloramines, sediment and particulate, cysts, copepods, VOCs, SOCs, THMs, PAHs, atrazine, benzene, xylene, pesticides, insecticides, herbicides, tastes, odors and hundreds of other potential contaminants and harmful chemicals from the water entering your business or home. utilize an advanced 3-stage filtration process leveraging our advanced EvenFlow-MaxContact™ process View our 3 filtration stages. utilize high grade NSF® certified water filtration media, tank, and components/parts/materials. are designed for Residential or Light Commercial applications. require no electricity, backwashing or backflushing. provide better-than-bottled water quality throughout your home or business for about 50¢/day, or well under 1 penny/gallon. are systems built with premium quality construction along with proprietary, multi-layered NSF® certified media. have a Lifetime Pro-rata Warranty. have a 6-month 100% Satisfaction Guarantee, allowing you to buy with complete confidence! are so advanced, effective and affordable, there is nothing out there that even compares...this is why we are literally "off the charts!" are the highest quality and most affordable system available anywhere in the world! allow for fast and easy installation without contracting a professional plumber. We strongly urge you to call us 24/7 at (Toll-Free) 1-888-446-8184 or (Outside USA) +1 (248) 585-0332 for a FREE Phone Consultation, or contact us via email and communicate your specific water condition(s) with one of our Water Filtration / Treatment Specialists so that we may immediately provide you with straightforward answers and high quality affordable options to fully and properly address your specific water conditions. The PureMaster™ V-Series™ (V-300™, V-500™, or V-700™) Whole Home Units (or drinking water systems) are designed for maximum contact time to ensure optimum filtration for: 300,000 gallons of water (3–5 years use for average household); 500,000 gallons of water (5–7 years use for average household); or 700,000 gallons of water (7–10 years use for average household). The PureMaster™ V-Series™ (V-300™, V-500™, or V-700™) is a Point-of-Entry (POE) system designed for municipally treated water but may also be used, in many cases, as a well water filter or treatment system. 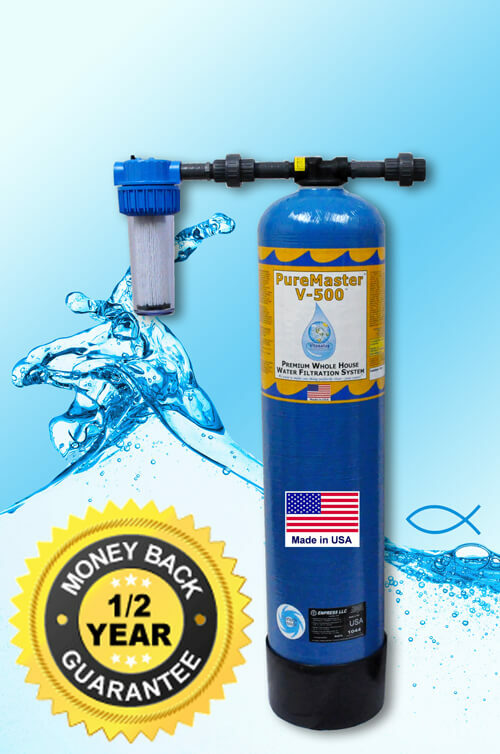 The PureMaster™ V-Series™ (V-300™, V-500™, or V-700™) may serve as a mild water softener, depending on your specific water conditions, or, it may also be installed after a water softener. And, the PureMaster™ V-Series™ (V-300™, V-500™, or V-700™) systems use an advanced multistage filtration process, ensuring maximum contact time, through NSF® certified high grade water filtration media which is special blended and layered. This deluxe, high capacity system, for both residential and light commercial applications, provides the most affordable and highest capacity of any Whole House Water Filtration System in America! Without a doubt, the Vitasalus (formerly Equinox Products) PureMaster™ V-Series™ (V-300™, V-500™, or V-700™) offers the most comprehensive and affordable home/business water filtration solution available today! To protect you and your family from the many known health risks of fluoride in your water supply, consider getting the highly-specialized PureMaster™ & FluorideMaster™ Combo System. Learn more about the many health risks of fluoride in your water supply. PLEASE NOTE: Routine replacement of the 0.35-micron prefilter will increase the effectiveness and significantly extend the life of your V-300 Premium Whole House Water Filtration System. PLEASE NOTE: Routine replacement of the 0.35-micron prefilter will increase the effectiveness and significantly extend the life of your V-500 Premium Whole House Water Filtration System. 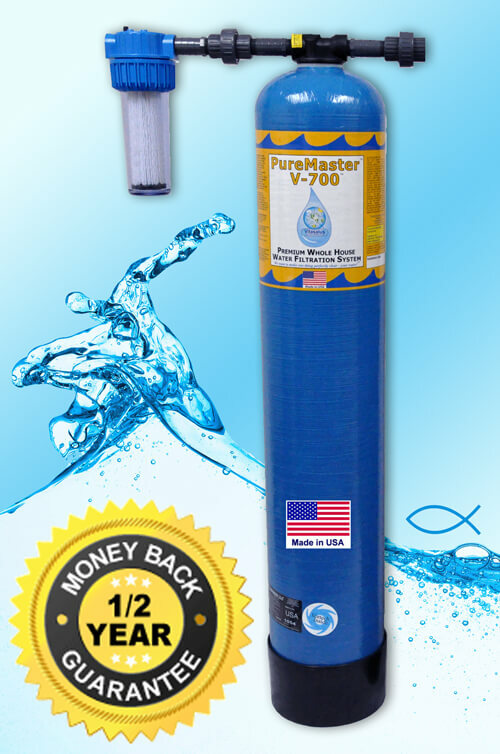 PLEASE NOTE: Routine replacement of the 0.35-micron prefilter will increase the effectiveness and significantly extend the life of your V-700 Premium Whole House Water Filtration System. NSF® is a registered trademark of NSF International. For more information, please visit https://www.nsf.org.